In Aunt Lena's world everything is wholesome and good. The air is filled with the smells of drying herbs and freshly baked pies. The food on the table is from her garden and the milk to wash it down with is from her goats. Aunt Lena not only wants her family to be happy and healthy, she wants that for you and your family, too. That's why she never uses chemical fillers, artificial colors, artificial fragrances or anything else that could be toxic or harmful. Her products are all natural all the time and as a bonus they're 100% biodegradable. 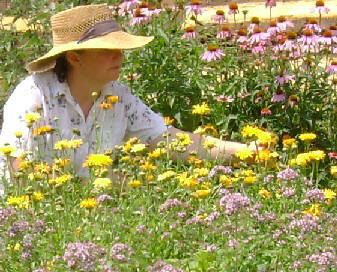 Aunt Lena picking calendula blossoms in her herb garden. The blossoms will be dried and later used in soap. Aunt Lena Says - "Always wear a wide rimmed hat when working outside to avoid getting a nasty sunburn on the delicate skin on your face and neck." The soap we hand make at our farm is made with our own creamy goat milk and pure saponified olive, coconut and palm oils. It is enriched with Vitamin E, vegetable glycerin, cocoa butter, herbs, spices, essential oils, resins and extracts to make a soap that is simply wonderful for your skin. It doesn't contain any chemical dyes, fragrances or fillers that could irritate and dry out your skin. 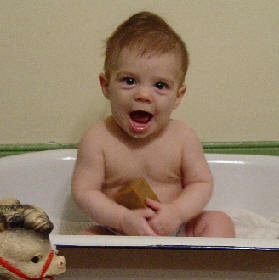 Our soap will not only cleanse, but leave your whole body incredibly soft and smooth. Since we use flowers, herbs and spices in our soaps, don't be surprised to find a few delightful color variations that help make our soap unique! Aunt Lena enjoys spending time outdoors in the sunshine with her goats. This one is Casey. 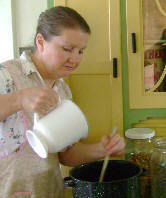 Aunt Lena mixing up a batch of her Lavender Mist Goat Milk Soap. 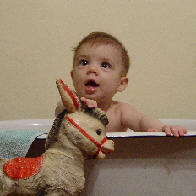 Our grandson Caleb loves taking baths with Aunt Lena's Original Goat Milk Soap. 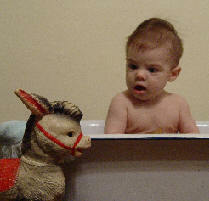 He says it helps keeps his skin "baby" soft.